Baseball history comes alive on your game table! Some of baseball's greatest-ever fall classic series can be re-lived again and again, with the "Famous Fall Classics" card sets for HMB! The drama and excitement of big league baseball's fall classic is at your fingertips ANYTIME, with the "Famous Fall Classics" and "MORE Famous Fall Classics" card sets for HISTORY MAKER BASEBALL! With either set, you get both teams from eight memorable fall classic match ups--sixteen vintage teams from baseball's past autumn glory, yours to enjoy again and again! 1919 Chicago (A) vs. Cincinnati (N): Best-known for "the fix," where Chicago players retaliated for the club owner's tight-fisted ways by taking pay-offs and throwing the series. Chicago's veteran, star-laden club faced an over-achieving Cincinnati club—led by a first-year manager—that hadn't finished higher than third place the entire century. Oddsmakers made them overwhelming underdogs—but the bets poured in for the Cincinnati side anyway (wink, wink). One of only a handful of fall classics to feature a best of nine format, Cincinnati "won" it five games to three. The following season, eight Chicago players were permanently banned from baseball for their part in the scandal. 1950 New York (A) vs. Philadelphia (N): Philadelphia's enthusiastic collection of young ball players captured the nation's fancy by winning the club's first NL pennant in 35 years with high drama on the final day of the season. But New York's depth, power, speed, talent and especially its pitching proved too much for Philly's "Whiz Kids." The result was a four game sweep in which Philadelphia scored just five runs. It was the second of five straight New York championships, still a record. 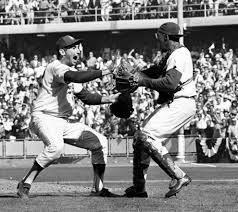 1960 New York (A) vs. Pittsburgh (N): Most notable for "The Shot Heard Round The World," Mazeroski's game seven, ninth-inning solo home run: it's the only time a fall classic has ended with a walk-off homer. New York was heavily favored to win the series, posted three blow-out wins (16-3, 10-0 and 12-0), and outscored Pittsburgh during the series by a whopping 55-27 margin. But the Bucs won the close games and Mazeroski's memorable blast earned the club its first world championship since 1925. Side note: this was the only time the series MVP was chosen from the losing team! 1970 Baltimore (A) vs. Cincinnati (N): A series featuring two powerhouse clubs who had each won over 100 games during the regular season and swept their opponents 3-0 in their respective league championship series. The first edition of Cincinnati’s “Big Red Machine” faced a Baltimore squad built around top-flight pitching, with three 20-game winners. The O’s scratched out a pair of one-run wins on the road to seize the momentum, and a blow-out win at home in game three put them up three games to none, eventually winning the series in five games. 1980 Kansas City (A) vs. Philadelphia (N): The first WS played exclusively on artificial turf, and the first in 60 years to match two clubs who had never before won a world championship. Despite having both the '80 league MVP and Cy Young winners on its roster, Philadelphia had a tough road to the fall classic, edging Montreal by a single game to win the division, then getting past Houston three games to two for the NL pennant. Kansas City's season was marked by its star 3B's flirtation with batting .400 for the season—he was over .400 as late as September 19th, finally ending up at .390. Game five held the series' key moment: trailing 4-3 in the bottom of the ninth inning, KC loaded the bases, but failed to score. Philly went up 3 game to 1, and won game six to capture its first ever world championship. 1984 Detroit (A) vs. San Diego (N): Detroit had set a big league record with its 35-5 start to the '84 season, eventually winning 104 games and holding first place in the division the entire year. San Diego was no powerhouse (their 92 wins was a franchise record), but saved its best baseball for last: down two games to none to Chicago in the NLCS, they rallied for three straight wins to earn their first berth in the fall classic. After splitting the first two games at Jack Murphy Stadium, Detroit's pitching clamped down in front of its home fans, and Detroit won three straight to clinch the series, 4 games to 1. 1994 Chicago (A) vs. Montreal (N): "The Series that never was," due to the players' strike that shut down the '94 season. When the bats and gloves were set aside August 12, Montreal had a 74-40 record, best in baseball. New York had the AL's best record, but since the Yanks are already represented twice in this collection ('50 and '60) we thought Chicago would make a more crowd-pleasing match-up. The burly ChiSox 1B (.353 BA with 38 homers, 113 games) was the trigger-man for Chicago's offense, matched up against Montreal's pitching and speed. 2011 Texas (A) vs. St. Louis (N): This series was defined by its never-to-be-forgotten game six, in which St. Louis overcame two-run deficits in both the bottom of the ninth and tenth innings. Texas was one strike away from winning the series in BOTH innings, but was unable to close the deal either time. St. Louis eventually won it in the eleventh with walk-off home run, and then won game seven and the world championship the following night in front of 47,000 delirious home fans. Everything you need to re-live each of these great series is HERE, in two great vintage baseball-lover's packages! In each collection, you get 27 cards for each of the sixteen teams--over 400 cards in all, PLUS, you also get individual cards for each of the series' actual umpires, as well as ball park cards and suggested batting orders. Hours of classic baseball fun and excitement, and either set is just $24! NOW AVAILABLE!